Aston Martin has also used the Lagonda name on some of its own models - most notably, perhaps, the chiselled 1974 Aston Martin Lagonda (below). At next month's Geneva auto show, Aston Martin will unveil the All-Terrain Concept, previewing an SUV for its new Lagonda full-electric brand. It will be the first to carry the Lagonda brand name that has been revived by Aston Martin and is dubbed as world's first luxury zero emission brand. The vehicle, of course, will also come with the carmaker's new fully-electric powertrain technologies. Aston Martin's first SUV is going to be the DBX. Unlike Rolls' vast, go-anywhere luxury vehicle, however, the All Terrain isn't powered by a big V12. Gone was the traditional leather and wood; in its place, carbon-fiber shared space with ceramics, cashmere, and silk, together with hand-woven wool. The SUV will be based on the same platform as the Lagonda luxury saloon that was revealed earlier. At the time, Aston Martin execs promised production cars as varied as sedans, coupes, and SUVs. It borrows styling cues - and melodrama - from the Vision Concept, as well as an all-EV drivetrain. Now, Lagonda is looking ahead to the future once more with an all-new concept simply called "All-Terrain". What's more? The vehicle by Lagonda will not only be handsome but also environment-friendly and boast autonomous driving tech. The assumption is that it's the same platform as last year's Vision Concept rode on, which would mean the ability to push up to 100-percent of overall torque to any corner of the vehicle, courtesy of multiple electric motors. A range figure of 400 miles was quoted by Aston, alongside a rapid wireless charge of the battery pack in just 15 minutes. 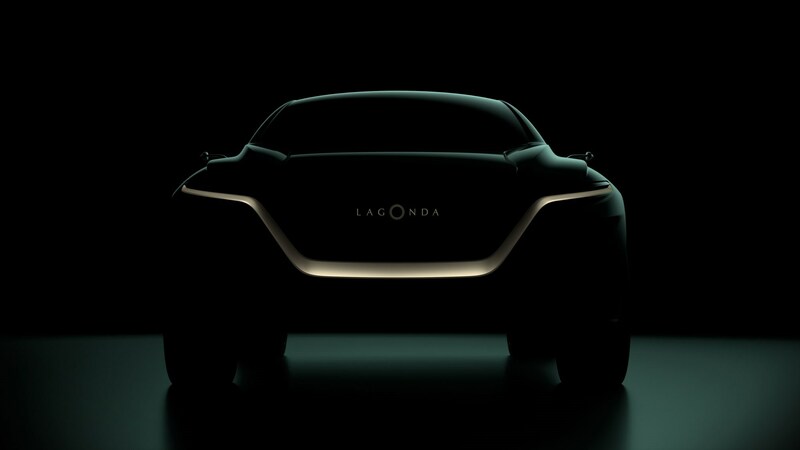 The new teaser is the only news from the brand about the Lagonda since the reveal of the Lagonda Vision Concept in Geneva a year ago that sought to integrate as many cool features and technologies into the Lagonda before being trimmed down to a real production version of the vehicle.